You can spend hours looking through the archives at Toledo Talk. The man is classless. He mistreats people, both staff and private citizens. But his rampages are hilarious. He provides great comedic fodder. He's not boring. Oh worst of all, he liked to cook his dog Scout in a vehicle. My dog Barney has already said that he won't vote for Czarty. According to the Toledo City Paper 'Best of Toledo' reader surveys, Czarty was/is the most hated AND the most loved local official. Carty has many fans or people looking for money handouts. FOC = Friends of Carty. This is awesome news that Uncle Carty is returning to the political election fray if you are an editorial cartoonist. Kirk at The Blade must be ecstatic. It will be funny from now to the November election. It's only sad if he wins. But if that's what the 25-percent voter turnout wants, then it's all good. Maybe Czarty will run as an independent. During his political career, I think that he's run as a republican, democrat, and an independent. If Czarty can attract the all-important votes from the worst-named group of people, millennials, then Mr. Czarty may win a 4th term. The question that I have is, does it truly matter what carbon blob is mayor of Toledo? 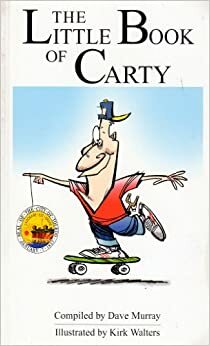 If you need more info about Carty, try to acquire a copy of the pathetically humorous book titled The Little Book of Carty, published in 2008 by the Toledo Blade. Carty has made some fascinating wackadoo comments over the years. It seems that his verbal abuse of others is legendary. Even Little Caesars Pizza franchises in Toledo changed the name of their Crazy Bread to Carty Bread. "Libertarians like Brian Wilson disliked him (putting it midly). Statists like Fred at WSPD base much of their advertiseing on whipping the dead horse of Carty Finkbeiner." At one time, WSPD loved Carty. That was back in December 2004 when Jack Ford was mayor, and it was assumed that Carty would run for mayor in 2005. This week on the Finkbeiner Radio Network formerly known as WSPD, Carty discussed how to take Toledo to the promise land. And it seems a lot of people bought into Carty's snake oil sales pitch. It's amazing how easily some people can be duped. Time doesn't heal wounds as much as it makes people stupid because they forget. In past Toledo City Paper's Best OFs, Carty has been voted a local hero, a local zero, and most embarrassing. In late June 2005, Carty officially announced that he would run for mayor again. Saying that Toledo needs leadership more willing to embrace the business community, Mr. Finkbeiner spoke of diversifying Toledo’s industrial base, working with local universities to create a local technology sector, and creating an automotive research and development “triangle” between Toledo, Detroit and Ann Arbor to spur job growth. Carty was once a Republican. Then he was a Democrat. Then an Independent. We haven’t heard anything about the Green or Libertarian parties, but anything’s possible. For now, he’s the leader of the Carty Party. Carty is a whirlwind always in motion, and folks mistake that for accomplishment. Also, as people here are fond of reminding one another, Carty’s the biggest cheerleader this city ever had, which sounds swell until you realize how this can also be the express route to a state of delusion. Carty is a wildly popular form of Toledo entertainment. We love him/hate him in equal measure, and can’t wait/can’t bear for him to run again for mayor. Allegedly, Carty did not run for mayor in 2009 because he promised his wife back in 2004 or 2005 that he would only run for one term. Yeah right. If true, that info would have leaked out years before 2009. “Carty has had his day,” Mr. Ludeman said. "I think there will be plenty of people running. He had three terms and he chose not to run for re-election at the end of the third term — which he could have — and that puts a question in my mind, why would he want to run now if he didn’t seek a full term in that situation?" In the fall of 2008, Carty's approval rating was 17 percent. I think that played into his decision not run for mayor in 2009. Regardless, Czarty running for mayor might liven things up a bit this fall, especially if "debates" are held. 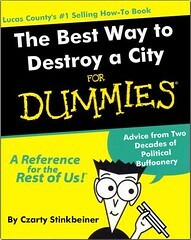 Is Keith Wilkowski available to run for mayor? Bring back 2005. "Carty has had his day." Ludeman was elected to Toledo City Council in 1993, which is the same year that Carty won his first term as mayor of Toledo. Ludeman served as a District 2 councilman for 14 years, and he has been an at-large councilman for over five years. 19 years on city council and counting. The term-limit length for each type of council seat is 12 years. If he keeps going, Rob will have served 26 years on Toledo city council. It seems strange that Rob would be telling someone else that he's had his day. If The Robster thinks that he's worthy of serving over two decades on city council, then Uncle Carty can run for mayor again. Ludeman needs to realize that it's not his decision. The voters can decide. And for some odd reason, voters think that Rob should still be on council. 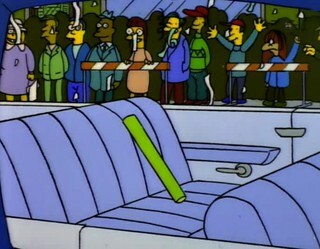 I'd vote for the Inanimate Carbon Rod. It saves lives in space. Imagine what it can accomplish here with the law of gravity on its side. Apparently, the Rod will ride in the King Wamba Parade at the Old West End Festival. And it's scheduled to attend many other summer events. Expect an announcement soon about the Rod running for mayor of Toledo, obviously, as a Green Party candidate. It may struggle, however, to garner an endorsement from the local iron workers union. It should be an interesting debate between PH2, Mr. Collins' widow, Opal, Carty, and the Rod. "... the visceral hatred ..."
It's definitely not "visceral hatred" because that requires energy, and the man is not worth it. It would be a hilarious riot if Czarty becomes mayor again, even if it's only for two years. Toledo needs to be nationally embarrassed a couple times a year, and Czarty is the man who can get results. "They'll probably have about 4,000, maybe 5,000, for the finals, and it will look like they're conducting some sort of a mini-version of a Klu Klux Klan meeting in a corner of Gund Arena." January, 1999, Carty was not pleased when the Mid-American Conference announced that it would pull its men's basketball tournament from Toledo and move it to Cleveland's Gund Arena. He was trying to explain his views on a WSPD-AM morning radio show when he came up with the KKK analogy. ... [Carty] remembered a scene from a rerun of an All in the Family episode in which Archie Bunker mistakenly went to a sparsely attended Klan rally in a large arena. The KKK was not pleased with Carty. 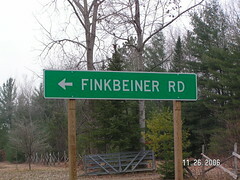 ... local Grand Dragon Bud Brennings declared, "Carty Finkbeiner is not a Klansman. We would not allow such a hateful man in our ranks." That's before my time in Toledo, but that's gold, baby. Only one brain can assemble that into some kind of response: Carty's. "... you are not a knee-jerk hater like others." "It proves my point about emotion versus reason and logic." A Czarty supporter who calls others "knee-jerk haters." A Czarty supporter who mentions "reason and logic." We don't need Czarty to become mayor to provide comedic fodder. We only need his staunch reporters to speak up. "I'm new to this town ..."
Right. You are a passionate supporter of someone who last won an election in 2005. But I'm with you, brother. I'm all in for Czarty. He'll chase the gangs into Maumee. "I have never experienced anyone on our police department who has exhibited such a blatant disregard for the profession of law enforcement and most importantly the Constitution of the United States." August, 1998, D. Michael Collins, president of the Toledo Patrolman's Association, wrote to Carty, telling him that he was acting like a "wacko dictator from some banana republic." Carty drew the ire of the Toledo police union and the ACLU after he ordered Police Chief Mike Navarre to rid the city of drug dealers living on Oakwood Avenue. "Harass, intervene with, do what is necessary to clean out these folks." "This mayor has, over time, demonstrated a disregard for the fundamental protections of citizens," said Chris Link, executive director of the ACLU. Now that's an accomplishment, irritating both the KKK and the ACLU. Don't overthink it. It's just politics. Names matter. Mr. Copeland is the nephew of the late Bill Copeland, a former city councilman and former county commissioner. Some of Phil Copeland's support appears to come from voters who are associating him with his uncle. "If my uncle's name is helping me, I'm thanking him right now," Mr. Copeland said. "I'll take it any day. He had a good name, and I'm trying to keep it up. … If they think I'm Bill Copeland, that's fine with me." I'm guessing that voters won't think that they are voting for D. Michael Collins in November, but you know, it is Toledo. I predict that 45,001 votes will be cast for Toledo's mayoral election in November. 20,000 votes may be enough to win.